Amid the general praise for the Barclays Center after the Nets' home exhibition debut last night--more on that in another post--one arena feature was surely unknown to the sports media. It was once a big deal. 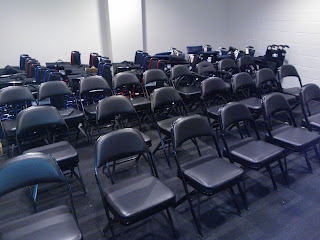 Now the Barclays Center meditation room--with wheelchair storage, no signage inside or out, holes in the ceiling, cinderblock walls, and a decidedly uncontemplative interior-- looks like an afterthought. I didn't see anyone using it. Or, to be charitable after a visit to the arena little more than two weeks after it opened, maybe, like some other parts of the arena, it's still being finished. At least, unlike nearly every other element of the Barclays Center, there's no branding attached. As some might recall, the Reverend Herbert Daughtry, who runs a Community Benefits Agreement (CBA) partner organization supported by Forest City Ratner, originally wanted a chapel. 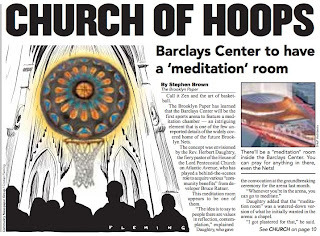 A religious space wouldn't fly, so instead emerged the meditation room or, as Daughtry called it in his dramatic 8/23/06 testimony at the hearing on the Atlantic Yards Draft Environmental Impact Statement, an atrium. "It will provide a place for our young, a place for the seniors, a place for the youth to come together in an atrium designed by us," he crowed, to the excitement of many followers in the audience. “To our knowledge, the meditation room at Barclays Center will be the first meditation room to be included in a new NBA arena,” said the [architects'] spokeswoman, Sara Cziok. However, in August of that year I pointed out that the room would actually be about 150 square feet. That likely was, at least in part, a consequence of the redesign and shrinking of the arena to save money. At the arena last night, no signage indicated either the location of or the entrance to the meditation room, which is likely why it was empty when I and a few others took a look. It doesn't look "designed by us" or, particularly, by anybody.